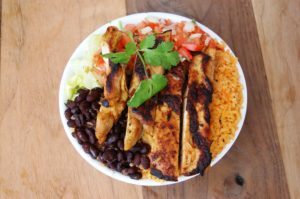 Casa Pasilla | Mexican Grill – New Name, Same Great Food! Formally known as Rosarito Fresh, we are now called Casa Pasilla. Same family owners, same location, just NEW NAME! 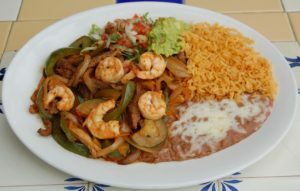 Serving SCV delicious Mexican dishes since 1998! Over 20 years ago our family opened its doors in Santa Clarita with one goal, to create savory Mexican dishes using using family recipes that have been passed down through generations. Try Tia Maria’s succulent garlic seasoned pork carnitas! Traditionally, carnitas are deep-fried but we simmer steam ours in it’s own juices for a healthier version that is still full of flavor. Or try Josie’s signature “Pasilla Chile Rellenos” a family favorite! Other favorites include our Sopes, Beer-Battered Fish Tacos & our Wet Chile Verde Burrito. 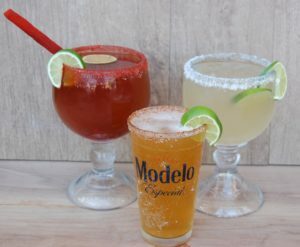 Make sure to pair your dish with one of our signature Michelada drinks (Classic, Mango or Strawberry)! Ay Dios mio! Three rolled corn tortillas stuffed with melted Jack cheese & your choice of shredded beef, shredded chicken or pork carnitas. Served with fresh guacamole & crema. Two rolled flour tortillas stuffed with melted Jack cheese & your choice of shredded beef, shredded chicken or pork carnitas. Served with fresh guacamole & crema. Fresh corn tortilla chips topped with your choice of our Pinto Refritos or Black Beans, melted Jack cheese, fresh guacamole, crema & pico de gallo. Hand-cut French fries topped with melted Jack cheese, fresh guacamole, pico de gallo & our signature Ranch flavored crema. Large flour tortilla stuffed with melted Jack cheese. Served with crema. Two hand-pressed corn masa cakes layered with creamy pinto refitos, lettuce, queso fresco, sour cream, pico de gallo, avocado & your choice of carne. 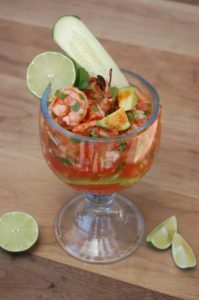 Fresh chopped avocado, cucumber, cilantro, tomato, onions & shrimp served in our flavorful homemade cocktail sauce. An assortment of mixed vegetables cooked slowly in a flavorful Mexican style chicken broth; topped with shredded chicken breast meat & melted Jack cheese. Served with a side of Spanish rice & crispy corn tortilla chips. 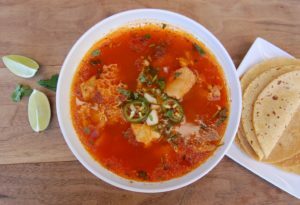 Chunks of tender pork & corn hominy simmered in a red chile base soup. Served with a side of shredded cabbage, radishes, limes, onions, cilantro and crispy flat tostada shells. A mix of fresh seasonal vegetables, tilapia & shrimp simmered slowly in a flavorful seafood broth. Served with your choice of handmade corn tortillas OR garlic bread. 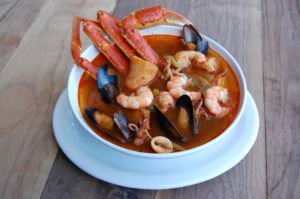 A fish stew that contains an assortment of fresh seasonal vegetables, scallops, calamari, shrimp, tilapia, snow crab, baby octopus & shelled mussels simmered slowly in a flavorful seafood broth. Served with your choice of handmade corn tortillas OR garlic bread. Fresh mix of greens, Spanish rice, choice of beans, Jack cheese, crema, fresh guacamole & pico de gallo. A large crispy flour tortilla shell filled with a fresh mix of greens, Spanish rice, choice of beans, Jack cheese, crema, fresh guacamole & pico de gallo. Stuffed with our creamy pinto refritos & melted Jack cheese. Spanish rice, pinto refritos, melted Jack cheese, fresh guacamole, crema, lettuce & pico de gallo. Roasted corn sauteed with zucchini, bell pepper, onions, tomato, Jack cheese, black beans, Spanish rice, guacamole & sour cream. Pan-seared Pasilla chile stuffed with melted Jack cheese, pinto refritos, Spanish rice, crema & our signature Salsa Ranchera. Filled with your choice of carne, pinto refritos, Spanish rice & melted Jack cheese. Choice of carne, hand-cut French fries, melted Jack cheese & our signature Ranch flavored crema. Choice of carne, sweet caramelized onions, spicy salsa, Spanish rice, pinto refritos & melted Jack cheese. Your choice of carne, pinto refritos, Spanish rice, melted Jack cheese, fresh guacamole, crema & pico de gallo. 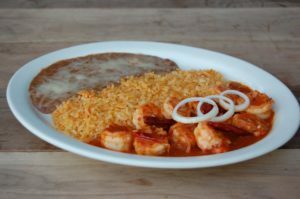 Shrimp pan-seared in our signature garlic butter sauce, melted Jack cheese, Spanish rice, choice of beans & pico de gallo. Crispy fish or shrimp hand-dipped in our signature seasoned beer-batter, fresh guacamole, Jack cheese, Spanish rice, onions/cilantro mix, cabbage & our special creamy chipotle sauce. Two crispy tacos stuffed with your choice of carne or potato; topped with lettuce, Jack cheese & fresh pico de gallo. Choices: Potato, Shredded Beef, Shredded Chicken or Pork Carnitas. Two soft tacos topped with your choice of carne, lettuce, Jack cheese & fresh pico de gallo. Served on soft corn tortillas. 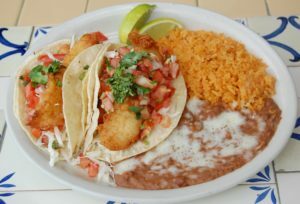 Two tacos prepared with your choice of Fish or Shrimp hand-dipped in our signature seasoned beer-batter. Topped with shredded cabbage, fresh pico de gallo & a side of our special creamy chipotle sauce. Served on flour tortillas. Two rolled corn tortillas stuffed with melted Jack cheese & your choice of Carne or Queso, baked in our red or green tomatillo salsa. Served with a side of crema. Two pan-seared Pasilla Chilies stuffed with melted Jack cheese, & topped with our signature Salsa Ranchera. Served with a side of crema and choice of flour or handmade corn tortillas. 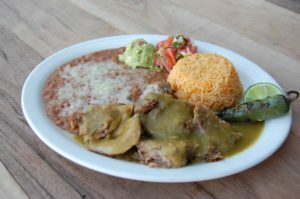 Tender pork carnitas simmered in our flavorful spicy green tomatillo salsa. Served with choice of flour or handmade corn tortillas. Tender beef sautéed in our flavorful spicy red chile salsa. Served with choice of flour or handmade corn tortillas. 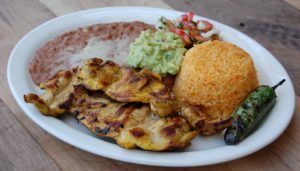 Citrus marinated charbroiled chicken served with a side of fresh guacamole & choice of flour or handmade corn tortillas. Chunks of garlic seasoned pork carnitas simmer steamed in it’s own juices. Served with fresh guacamole & choice of flour or handmade corn tortillas. Citrus marinated steak ranchera served with a side of fresh guacamole & choice of flour or handmade corn tortillas. Tender beef sauteed with garlic, bell pepper, onions & tomatoes. Served with choice of flour or handmade corn tortillas. 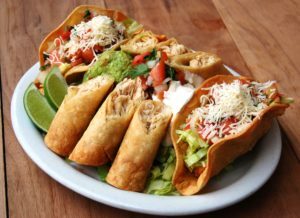 Includes two Taco Dorados, 3 Taquitos, & one veggie Mexican tostada layered with creamy pinto refritos, Spanish rice, lettuce, Jack cheese, guacamole, crema & pico de gallo. 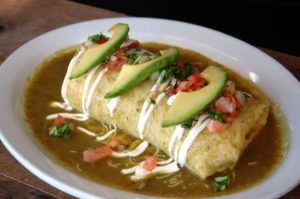 Includes 1 Wet Burrito stuffed with melted Jack cheese, crema & your choice of carne & 1 Taco (Dorado or Suave). Served with Spanish rice & pinto refritos. 2 rolled flour tortillas stuffed with melted Jack cheese & fajitas, then baked in our signature Salsa Ranchera. Served with Spanish rice, pinto refritos, crema & fresh guacamole. Garlic-buttered tilapia pan-seared & seasoned Cajun style. Served with a side of fresh guacamole & choice of flour or handmade corn tortillas. Garlic buttered shrimp sautéed in our signature sweet & spicy red chipotle sauce. Served with choice of flour or handmade corn tortillas. Shrimp sautéed in our flavorful garlic butter sauce. Served with a side of fresh guacamole & choice of flour or handmade corn tortillas. A mix of juicy charbroiled chicken, ranchera steak & shrimp sautéed with zucchini, tomatoes, onion & bell pepper. *Flavored with our signature Fajita sauce. Served with a side of fresh guacamole & choice of flour or handmade corn tortillas. *Select soft tacos served on fresh handmade corn tortillas. Your choice of carne topped with fresh chopped onions & cilantro. Served on a soft corn tortilla. 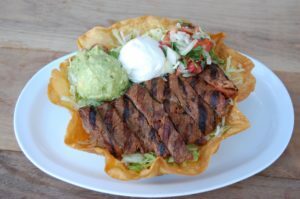 Your choice of carne topped with Jack cheese, lettuce & fresh pico de gallo. Served on a soft corn tortilla. Small pan-fried passilla chile stuffed with melted Jack cheese, crema & our signature Salsa Ranchera. Served on a soft corn tortilla. *Served on a soft flour tortilla. Crispy corn tortilla stuffed with melted Jack cheese & seasoned potato puree; topped with lettuce, more cheese & fresh pico de gallo. Crispy corn tortilla stuffed with your choice of carne, lettuce, Jack cheese & fresh pico de gallo. All kid meals are served with a side of Spanish rice, choice of beans (Pinto Refritos or Black Beans ) & one small fountain drink. One enchilada roja stuffed with melted Jack cheese & your choice of shredded chicken, shredded beef or pork carnitas. Your choice of one Soft or Crispy taco made with tender beef, pollo or pork carnitas, topped with lettuce & shredded Jack cheese. Flour tortilla stuffed with melted Jack cheese & choice of beans. Flour tortilla stuffed with melted Jack cheese. A creamy flavorful custard dessert topped with whipped cream & sweet caramelized syrup. 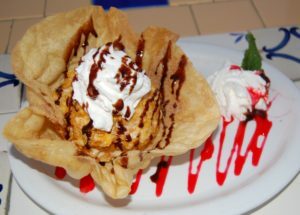 Creamy vanilla ice cream dipped in crispy corn flakes, deep fried the Mexican way. Served in a cinnamon & sugar coated crispy flour tostada shell. Topped with chocolate & strawberry syrup, and whipped cream. Churro dipped in creamy vanilla ice-cream. Topped with chocolate syrup & whipped cream. A Mexican favorite made with milk, rice water, cinnamon & sugar. The perfect refreshing beverage to soothe your taste buds after a spicy Mexican meal. Made in-house daily. A sweet ruby red Mexican tea made with an infusion of dried hibiscus flowers & sugar. Made in-house daily. A sweet & tart agua fresca made with fresh tamarind pods & sugar. Made in-house daily. Unsweetened Ice tea brewed fresh daily. Fresh brewed coffee made with freshly ground coffee beans & cinnamon. 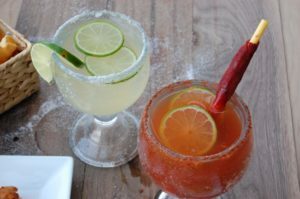 Known as the Mexican Bloody Mary, made with fresh lime juice, Clamato, Mexican beer & chile lime sea salt. Sweet & spicy, made with strawberry, Chamoy, fresh lime juice, Mexican beer & chile-lime sea salt. Served with a sweet & sour tamarind candy. Wine margarita made with fresh lime juice. *Strawberry or Lime. Scrambled eggs, breakfast potatoes & melted Jack cheese. Scrambled eggs, choice of beans (black or pinto refritos) & melted Jack cheese. Crispy corn tortilla chips sauteed in our special red or green tomatillo salsa, topped with melted Jack cheese & queso fresco. Crispy corn tostada topped with eggs prepared to your liking, melted Jack cheese & our signature Salsa Ranchera. Scrambled eggs sauteed with tomatoes, onions & green bell pepper. Served with your choice of flour or handmade corn tortillas. Spicy pork sausage mixed with scrambled eggs. Served with your choice of flour or handmade corn tortillas. Tender shredded beef mixed onions, tomato, bell pepper & eggs. Served with your choice of flour or handmade corn tortillas. Creamy refried pinto beans topped with melted Jack cheese. Whole black beans topped with melted Jack cheese. Crispy corn tortilla chips served with your choice of salsa. Crispy corn tortillas chips served with a side of fresh guacamole. 3 classic handmade corn tortillas made fresh to order. 12 fresh steamed tamales with filling of your choice. -For tamale orders, we require 24 hours advance notice. Thank you for your cooperation. Rosarito Fresh would be honored to cater your next event. No matter the size, big or small, we’ve got you covered! Impress your guests by having them enjoy Rosarito tacos prepared on handmade tortillas, right from our mobile taco cart. Or share with us your favorite menu items and we will customize the perfect meal for your guests. Don’t see it? Just let us know.